We’d love your help. Let us know what’s wrong with this preview of Ribbons of Scarlet by Kate Quinn. Six bestselling and award-winning authors bring to life a breathtaking epic novel illuminating the hopes, desires, and destinies of princesses and peasants, harlots and wives, fanatics and philosophers—six unforgettable women whose paths cross during one of the most tumultuous and transformative events in history: the French Revolution. 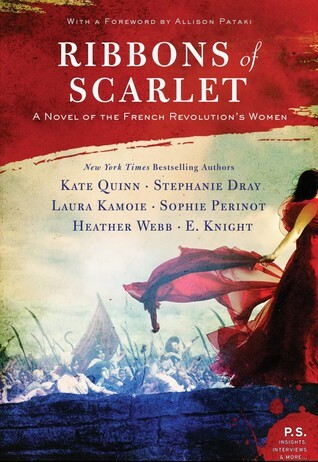 Ribbons of Scarlet is a timely story Six bestselling and award-winning authors bring to life a breathtaking epic novel illuminating the hopes, desires, and destinies of princesses and peasants, harlots and wives, fanatics and philosophers—six unforgettable women whose paths cross during one of the most tumultuous and transformative events in history: the French Revolution. 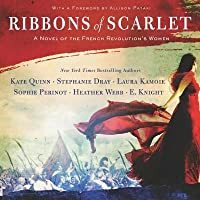 Ribbons of Scarlet is a timely story of the power of women to start a revolution—and change the world. In late eighteenth-century France, women do not have a place in politics. But as the tide of revolution rises, women from gilded salons to the streets of Paris decide otherwise—upending a world order that has long oppressed them. Blue-blooded Sophie de Grouchy believes in democracy, education, and equal rights for women, and marries the only man in Paris who agrees. Emboldened to fight the injustices of King Louis XVI, Sophie aims to prove that an educated populace can govern itself--but one of her students, fruit-seller Louise Audu, is hungrier for bread and vengeance than learning. When the Bastille falls and Louise leads a women’s march to Versailles, the monarchy is forced to bend, but not without a fight. The king’s pious sister Princess Elisabeth takes a stand to defend her brother, spirit her family to safety, and restore the old order, even at the risk of her head. To ask other readers questions about Ribbons of Scarlet, please sign up. Does anyone know if Kate Quinn's short story The Tumbril will be included in this collection? Or perhaps has she written a new story just for it? Nevertheless, very excited! Heather Webb It won't be included, no. This is a novel. :) She wrote The Tumbril some time ago.